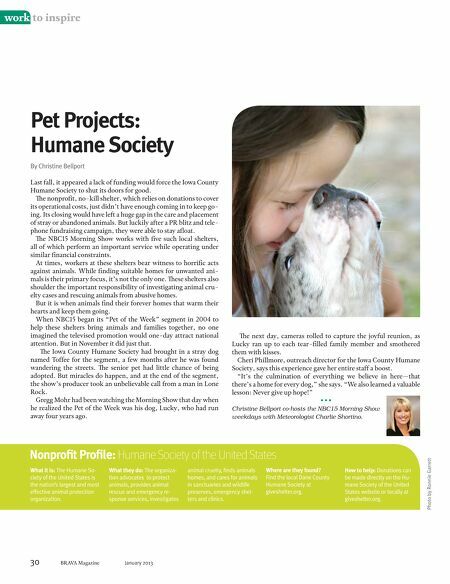 work to inspire Pet Projects: Humane Society By Christine Bellport The next day, cameras rolled to capture the joyful reunion, as Lucky ran up to each tear-filled family member and smothered them with kisses. Cheri Phillmore, outreach director for the Iowa County Humane Society, says this experience gave her entire staff a boost. ���It���s the culmination of everything we believe in here���that there���s a home for every dog,��� she says. ���We also learned a valuable lesson: Never give up hope!��� ��������� Christine Bellport co-hosts the NBC15 Morning Show weekdays with Meteorologist Charlie Shortino. Nonprofit Profile: Humane Society of the United States What it is: The Humane Society of the United States is the nation���s largest and most effective animal protection organization. What they do: The organization advocates to protect animals, provides animal rescue and emergency response services, investigates animal cruelty, finds animals homes, and cares for animals in sanctuaries and wildlife preserves, emergency shelters and clinics. Where are they found? Find the local Dane County Humane Society at giveshelter.org. How to help: Donations can be made directly on the Humane Society of the United States website or locally at giveshelter.org. For more information: Find out more about the organization, ways you can help and 30 BRAVA Magazine January 2013 Photo by Ronnie Garrett Last fall, it appeared a lack of funding would force the Iowa County Humane Society to shut its doors for good. The nonprofit, no-kill shelter, which relies on donations to cover its operational costs, just didn���t have enough coming in to keep going. Its closing would have left a huge gap in the care and placement of stray or abandoned animals. But luckily after a PR blitz and telephone fundraising campaign, they were able to stay afloat. The NBC15 Morning Show works with five such local shelters, all of which perform an important service while operating under similar financial constraints. At times, workers at these shelters bear witness to horrific acts against animals. While finding suitable homes for unwanted animals is their primary focus, it���s not the only one. These shelters also shoulder the important responsibility of investigating animal cruelty cases and rescuing animals from abusive homes. But it is when animals find their forever homes that warm their hearts and keep them going. When NBC15 began its ���Pet of the Week��� segment in 2004 to help these shelters bring animals and families together, no one imagined the televised promotion would one-day attract national attention. But in November it did just that. The Iowa County Humane Society had brought in a stray dog named Toffee for the segment, a few months after he was found wandering the streets. The senior pet had little chance of being adopted. But miracles do happen, and at the end of the segment, the show���s producer took an unbelievable call from a man in Lone Rock. Gregg Mohr had been watching the Morning Show that day when he realized the Pet of the Week was his dog, Lucky, who had run away four years ago.